Above, Epsilon CrA's brightness varies continuously as each star passes in front of the other, indictative of a contact binary. To the right, the radial velocity curves of the two stars differ enormously, showing that the principal star (the one that shows the least movement) is 8 times more massive than the secondary. 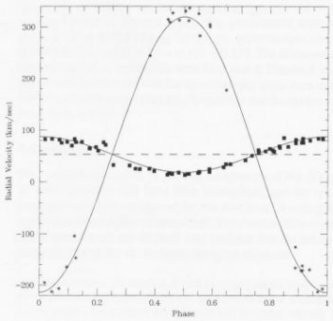 Light curve from S. M. Rucinski in the Publications of the Astronomical Society of the Pacific; velocity curves from K.-D. Goecking and H. W. Duerbeck in Astronomy and Astrophysics. stars are only 0.0172 Astronomical Units, just 2.9 million kilometers, apart, the plnae of the orbit tilted through 72 degrees relative to the plane of the sky. The brighter and fainter have respective radii of 2.20 and 0.85 solar radii and masses of 1.72 and 0.22 solar masses (very close to the values derived from luminosity and temperature), giving Eps CrA one of the highest mass ratios known among contact binaries. The "radii" are misleading and do not add up to contact because the stars are so distorted. The rotational period determined from the spectrum is in close agreement with the orbital period. The stars spin so fast that they produce considerable magnetic activity and dark starspots that also add to the variation as they swing in and out of view. Such systems are not well understood. In spite of its much lower mass, the smaller star has the same temperature as the larger one, an effect called the "contact binary paradox," the more massive star somehow feeding energy into the less massive. As strange as these systems are, they are not that uncommon. As many as one percent of the solar type stars may be in such a situation. Will they merge into one? Nobody knows. Not content with such oddness, Epsilon CrA adds to it by being a relatively high velocity star, moving at 60 kilometers per second relative to the Sun, over three times faster than normal, showing that it is not a regular member of the solar neighborhood.